With its relaxed exterior, front wrap-around porch, and dormers, this home allows for both formal entertaining and casual family living. The dramatic great room boasts a cathedral ceiling with large clerestory windows and a stone veneer fireplace flanked by built-in cabinets. French doors expand living space to the full length rear porch. The center island kitchen is spacious and open to the sunny breakfast bay. 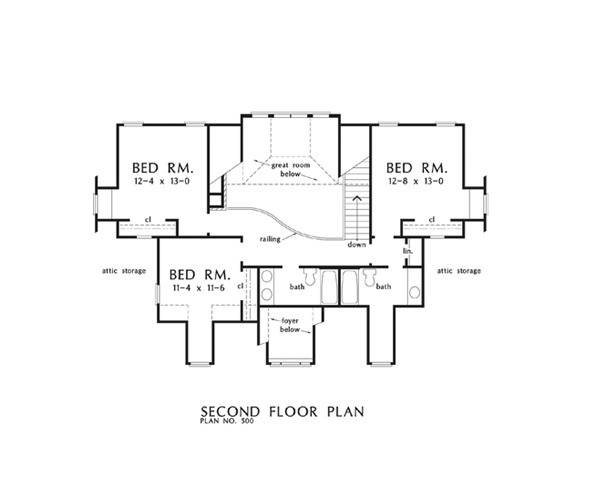 The first-floor master suite has ample closet space and a roomy private bath. 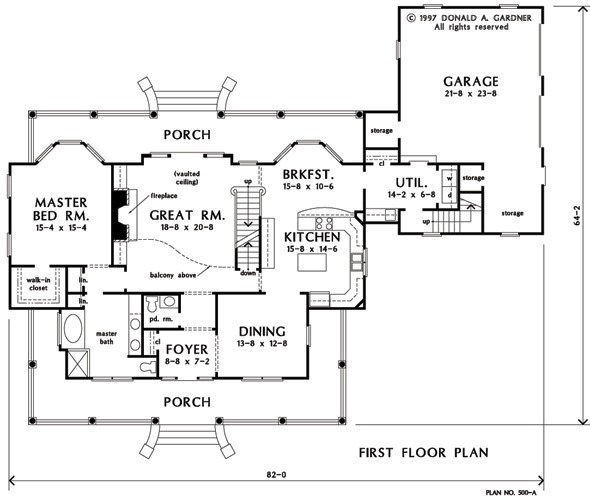 Three more bedrooms and two bathrooms are upstairs. The upstairs hallway serves as a balcony overlooking the great room below. 1st Floor: 1831 Sq. Ft.
2nd Floor: 941 Sq. Ft. 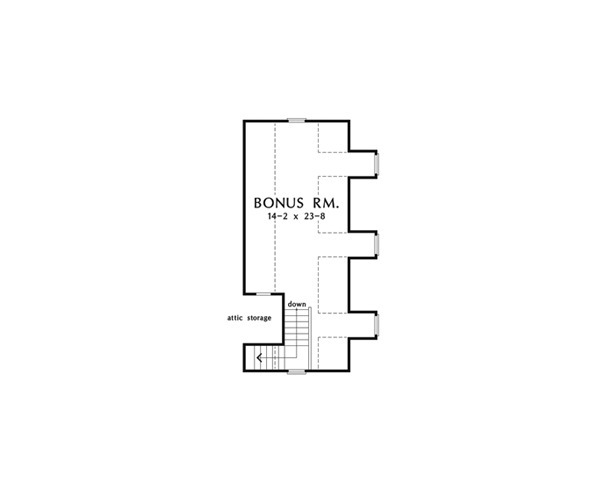 Bonus Room: 539 Sq. 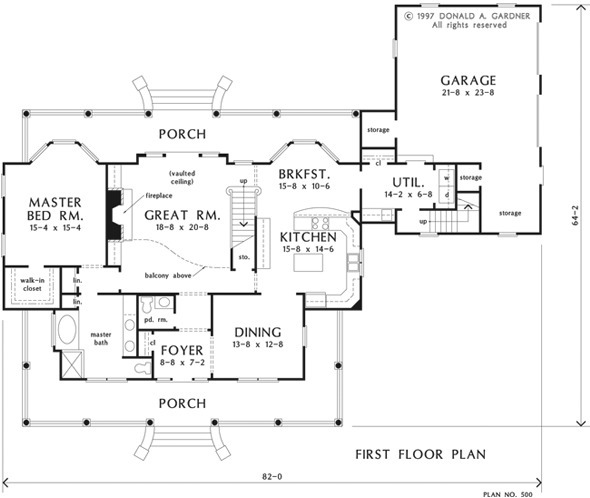 Ft.
House Dimensions: 82' 0" x 64' 2"
Foyer (Vaulted): 8' 8" x 7' 2" x 21' 0"
Dining Room : 13' 8" x 12' 8" x 9' 0"
Great Room (Vaulted): 18' 8" x 20' 8" x 22' 0"
Kitchen : 15' 8" x 14' 6" x 8' 10"
Breakfast Room : 15' 8" x 10' 6" x 8' 10"
Utility Room : 14' 2" x 6' 8" x 9' 0"
Bonus Room : 14' 2" x 23' 8" x 9' 0"
Garage Storage : 8' 10" x 10' 8" x 0' 0"
Master Bedroom : 15' 4" x 15' 4" x 8' 10"
Bedroom #3 : 11' 4" x 11' 6" x 8' 0"
Porch - Rear : 51' 4" x 8' 0" x 0' 0"
Balcony : 22' 4" x 3' 10" x 8' 0"
Storage (1st Fl.) : 3' 4" x 9' 2" x 0' 0"
Other : 3' 4" x 4' 0" x 0' 0"